I debated on sharing this. I considered keeping it to myself but slept on it and decided it might help someone else grieving feel less alone. This essay is being written with my left thumb only. I’m typing it on my cell phone, actually. 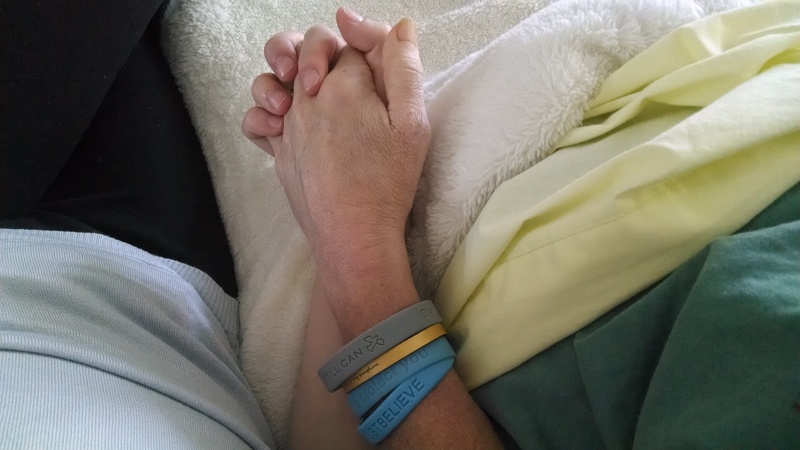 And I am writing it from my mom’s hospital bed, snuggled up next to her and holding her hand as she sleeps. That’s the news I debated sharing: I am laying in her hospital bed. I thought that truth might be met with a level of horror or disgust, but as my mom taught me, the only opinion of myself that matters is my own. I found it necessary to lay here. It’s not just comforting to her, but comforting for me to feel her and feel her breathing. There is nothing for her to be sorry for, and I know it is only a matter of time before she must leave me. I cannot keep her or save her, and I know that. But from her hospital bed, despite her lack of speech and movement, she was trying to console me as she has for the last 27 years of my life. The truth is that I will always need my mom. She signed “I love you” and finger-spelled “the” which meant she was saying, “I love you the mostest”. I repeated it back to her to confirm I understood and reciprocate the feeling. She started getting tired, confused, and frustrated by trying to sign as her hand is starting to lose strength. But she nevertheless comforted the breakdown that I had tried so hard to prevent in her presence. And then she ultimately slept forba very long time. I have been laying in bed with her for the last two hours talking to her and holding her hand. She hasn’t woken up for a second. The hospice nurse was also unable to rouse her. But I will continue to hold her hand and be here just in case she wakes. My mom has always been there for me, even with her minimal time left on this earth. I’d like to think I’ve returned the favor and the love. I hope she heard everything. She’s somewhere in there. And her heart is in mine forever. In the end, that’s the consolation prize. P.S. If this essay is ridden with typos and autocorrect disasters, my cramping left thumb apologizes. I will correct them at a better time. This entry was posted in on change, Uncategorized and tagged mom on July 30, 2014 by torileighbest.